The Intrepid Office Chair is as rugged as its name. It's built for intensive use. 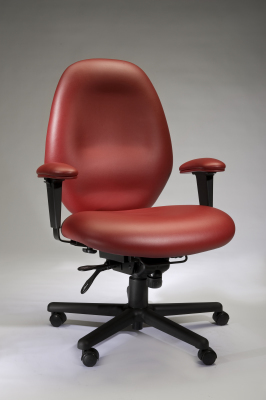 The Intrepid features all of the ergonomic functionality of the Huntington –free-floating seat and back angles that can be locked in any position, along with back height, seat depth, and seat height adjustments – but with more rugged parts, including a heavier duty control, cylinder and base. 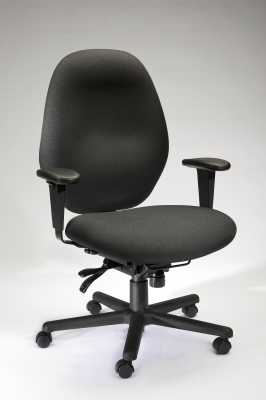 It is important to us that our intensive use chair remains ergonomic, but also that we adhere to strict standards of durability. That's why the Intrepid meets Federal Standard FNEW-83-269E Intensive Use. With the Intrepid, you can rest assured that you are getting the highest embodiment of ergonomic functionality and durability. If you are looking for a chair that will last through intensive use and will help the intensive user last, we offer you the Intrepid. The Intrepid Office Chair also accommodates the "big and tall" user. It has a capacious waterfall seat, a large back and a 450 lb. weight capacity. Seat Depth: adjusted by lifting the front bar, which controls the sliding seat mechanism.